The book is the first English translation of Nicolai Hartmann's final book, published in 1953. It will be of value to graduate students in philosophy, scholars concerned with 20th century Continental philosophy, students of aesthetics and art history and criticism, and persons in and out of academic philosophy who wish to develop their aesthetic understanding and responsiveness to art and music. Aesthetics, Hartmann believes, centers on the phenomenon of beauty, and art "objectivates" beauty, but beauty exists only for a prepared observer. Part One explores the act of aesthetic appreciation and its relation to the aesthetic object. It discovers phenomenologically determinable levels of apprehension.Beauty appears when an observer peers through the physical foreground of the work into the strata upon which form has been bestowed by an artist in the process of expressing some theme. 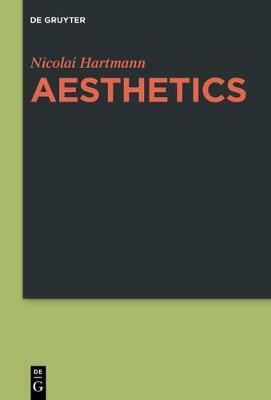 The theory of the stratification of aesthetic objects is perhaps Hartmann's most original and fundamental contribution to aesthetics. He makes useful and perceptive distinctions between the levels in which beauty is given to perception by nature, in the performing and the plastic arts, and in literature of all kinds. Part Two develops the phenomenology of beauty in each of the fine arts. Then Hartmann explores some traditional categories of European aesthetics, most centrally those of unity of value and of truth in art. Part Three discusses the forms of aesthetic values. Hartmann contrasts aesthetic values with moral values, and this exploration culminates in an extensive phenomenological exhibition of three specific aesthetic values, the sublime, the charming, and the comic. A brief appendix, never completed by the author, contains some reflections upon the ontological implications of aesthetics. Engaged in constant dialogue with thinkers of the past, especially with Aristotle, Kant and Hegel, Hartmann corrects and develops their insights by reference to familiar phenomena of art, especially with Shakespeare, Rembrandt and Greek sculpture and architecture. In the course of his analysis, he considers truth in art (the true-to-life and the essential truth), the value of art, and the relation of art and morality. The workstands with other great 20th century contributors to art theory and philosophical aesthetics: Heidegger, Sartre, Croce, Adorno, Ingarden, and Benjamin, among others.